Count the objects in these sorting numbers worksheets and match with the corresponding number. First, kids start by saying the numbers and tracing them. Second, they color the pictures and cut them out. Lastly, they glue them next to the number that matches the number of objects. Cute themes – pumpkins, creepy crawly creatures, and beach fun – are sure to keep kids interested, counting, and learning. 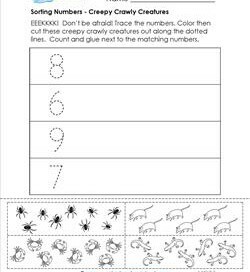 These worksheets require crayons, scissors, and glue so get those supplies ready! And don’t forget pencils so kids can write their name. EEEKKKK! Don’t be afraid of these creepy crawly creatures. Color then cut them out. Count and glue next to the matching numbers. Trace the numbers. 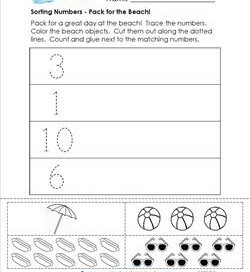 This sorting numbers worksheet will get you thinkin’ about packin’ for a day at the beach! Color, cut out, and glue next to the matching numbers. Here’s a sorting numbers worksheet for the fall! Color the pumpkins. Cut out along the dotted lines. 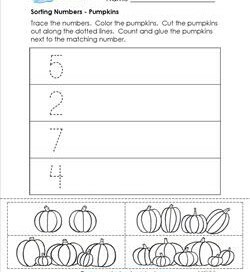 Count and glue pumpkins next to the matching number.